Paracord is the survival cord of choice because it has a high tensile strength compared to its small diameter. This makes it perfect for storing in an emergency kit or in a quick-deploy bracelet. Our paracord and shock cord is rot resistant and UV fade resistant, meaning it will remain strong—and good looking—through the toughest of conditions! What Kind of Paracord Should I Use? 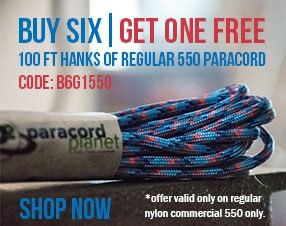 When people talk about paracord, they usually mean the 550 lb. tensile strength cord used in military parachute suspension, but there are actually 4 different "types" of military-grade paracord. In addition to those, we carry a few other paracord varieties, including shock/elastic cord and types specifically for wilderness survival. Whether you are prepping for the next zombie incursion or crafting a fantastic homemade gift, we have the cord for you! 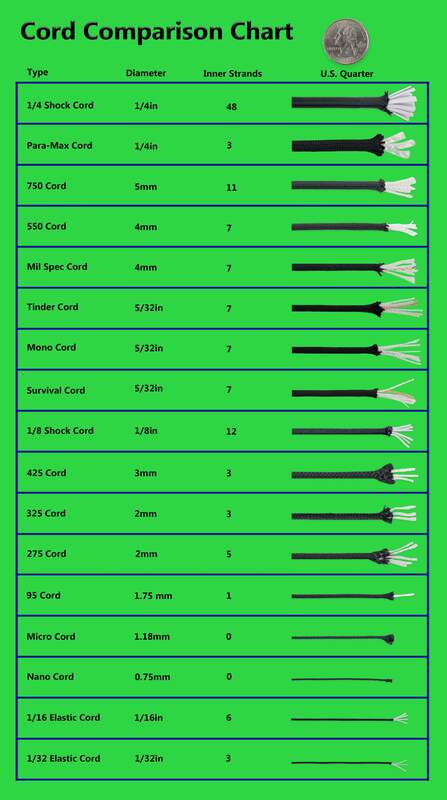 More details on each type of cord can be found below the comparison chart, including which paracord bracelet buckles and clasps work best with each kind. 550 Paracord is our most popular variety because it offers a great balance of strength and flexibility. It has countless uses and is perfect for crafting bracelets, repairing clothing, constructing handle wraps, and for hunting, fishing, and camping. We offer standard 550 and also Military Spec cord (cord that has undergone more rigorous strength and durability testing). Nano Paracord is our thinnest cord but it has no shortage of great uses. It's small size means that large amounts can be packed into a very small space. This little cord can be used for crafting smaller bracelets and jewelry, as well as for certain emergency situations where a high strength rating is not necessary. Micro goes great by itself or with our 550 cord for a little added color for any woven Paracord patterns. Its a strong little cord that has just a many potential uses as our popular 550 cord. Our favorite uses for the Micro Paracord have been for Paracord necklaces and laced cobra bracelets. 95 paracord falls between our 275 and Micro cord. While it is thicker than micro cord, it has the same tensile strength. It has only one inner strand, making it a highly flexible cord. This thin cord is used for countless projects such as macramé, bracelets, wind chimes and many other weaving projects. 275 paracord is unique in that it is one of our stiffest paracords. It packs 5 core strands inside its 2 mm sheath and has about a 7" standout. This thin cord is great for crafting and repairing. 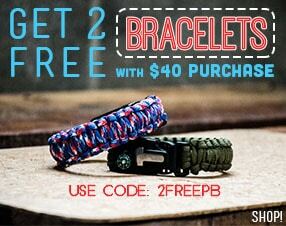 It works especially well for small paracord projects such as kids bracelets, keychains, and lanyards. 325 paracord is a happy medium between micro and the traditional 550 cord. It is perfect for projects where you need a thinner cord, but still require strength and durability, such as smaller bracelets, boot laces, belts, keychains, leashes, and other crafting projects. 425 paracord is noticeably thinner than 550, in spite of the mere millimeter difference. It's great for projects where 550 paracord is just a little too thick. Standard 650: Great for crafting and adding bulk to projects. Puffy inner strands do not flatten like standard paracord. Coreless 650: Here due to popular demand! Perfect choice for most handle wraps and weaving projects. Parapocalypse: The ultimate survival paracord! This cord is your all-in-one wilderness survival kit. Includes waxed jute strand for tinder, 10 lb. monfilament fishing line, high strength Dyna X cord, and Nano Aramid fire resistant 110 lb. cord. Bigger and better than 550 paracord, 750 is the strongest tactical paracord available. Slightly thicker than 550 paracord, 750 paracord is 26% stronger. It is used for countless projects such as belts, leashes, emergencies, and heavier duty projects. The toughest paracord, this cord has a 2650 lb. tensile strength. Less stretchy and less flexible than other varieties, this is one tough cord! Each inner strand has a strength of 340 lb! 1/32” Shock Cord is dependable, tough and stretchy. It is used for countless projects such as DIY jewelry, gift wraps, home décor, bracelets, display cards, scrap-booking, name tags and masks. 1/16” Elastic Cord is dependable, tough and stretchy. It is used for countless projects such as DIY jewelry, gift wraps, home décor, bracelets, display cards, scrap-booking, name tags and masks. 1/8” Shock Cord is manufactured for its elastic qualities and integral strength resistance while elongated. It is used for countless projects such as bungee straps, cargo nets, hammocks, securing items, and transporting boxes. It can also be used as an elastic core for a traditional paracord bracelet, so it can slide over your hand without using a buckle closure. 1/4” Shock Cord is manufactured for its elastic qualities and integral strength resistance while elongated. It is used for countless projects such as bungee straps, cargo nets, hammocks, securing items, and transporting boxes.